Escape the hustle bustle of everyday life and immerse yourself in the slow pace of rural France – picturesque rivers and canals, tranquil countryside, sleepy cobbled villages, medieval churches and magnificent hilltop views over the Nivernais Valley. 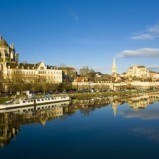 Day 2: Bassou to Auxerre 18km / 8 locks / 5hrs of cruising Auxerre is the largest city in the area, steeped in history and bustling with markets, shops and French patisseries. Be sure to visit St Etienne Cathedral and its impressive stained glass windows, as well as the 6th century Abbey of St Germain, the city’s most venerable monument with is remarkable 12th century steeple. Day 3: Auxerre to Vincolettes 13km / 8 locks / 4hrs of cruising There’s time to stroll back into Auxerre this morning for some shopping, a spot of lunch in one of many fine eateries and to stock up on provisions. Then head onwards to Bailly for a tour of the Wine Cooperative – housed deep underground in four hectares of underground galleries and tunnels. Day 4: Vincolettes to Mailly-la-Ville 15km / 8 locks / 5hrs of cruising Walk or cycle to Escolives Sainte Camille, where archaeological diggings have unearthed fascinating vestiges of Roman occupation. Next stop is the pretty and flower-adorned village of Cravant, once a fortified village with remains of the walls and moat still visible. Day 5: Mailly-la-Ville to Châtel Censoir 13km / 6 locks / 4hrs of cruising Stunning views over the Nivernais valley can be seen in the hilltop village of Mailly-le-Château before cruising onwards, past the Saussois Rocks, an impressive wall of limestone that towers over the canal for almost 50 meters. More impressive views await in Châtel Censoir where you can amble around the ancient church and tumbledown walls. Day 6: Châtel Censoir to Clamecy 18km / 10 locks / 5hrs of cruising A trip away from the canal to the UNESCO World Heritage site of Vezelay is well worth it. Wander around the ramparts, past the traditional 15th – 17th century houses, charming boutiques, galleries cafes and restaurants. At the centre the splendid Basilique Ste Marie-Madeleine draws you in, a wonderful example of Romanesque architecture. 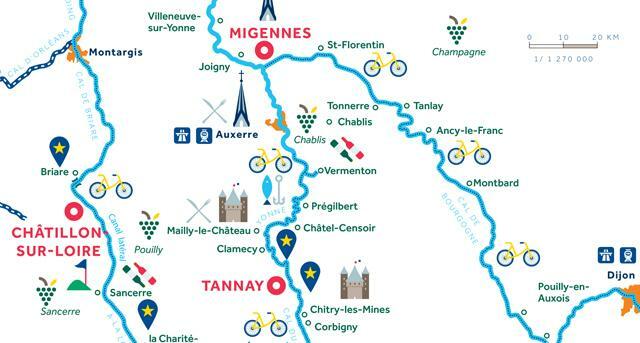 Day 7: Clamecy to Tannay 18km / 8 locks / 4hrs of cruising Flanked by three waterways, the stunningly attractive town of Clamecy is described as the ‘town of beautiful reflections’ and a stroll through its winding streets is a true delight. There’s time for a stop in medieval Dornecy before finishing in Tannay which sits high on a hill overlooking acres of vineyards.